The A19 will delight music lovers of all generations. It delivers exceptional transparency and detail with ultra-low level distortion and is perfect for those looking for reference level sound quality at a sensible price. Featuring some of the latest thinking in high performance amplifier design, the A19 uses components and techniques mormally found in Arcam's top of the range products. 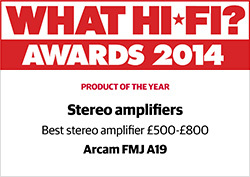 The amplifier's design and performance have been refined and tuned to an exquisite degree. This focus on sound quality has led to an intellegent power supply design that also enables the amplifier to offer a flexible upgrade path. The power section of the A19 is design to be able to supply two of Arcam's class-leading r-Series products in addition to its main duties. This allows the A19 to become a digital hub for a whole range of digital connection upgrades that includes both wireless Bluetooth® devices and USB sources. While the world of music is increasingly a digital one, analogue sources are not forgotten. 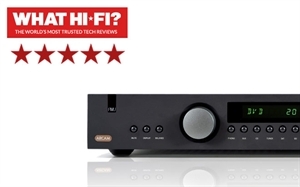 The continued popularity of vinyl has led Arcam to to equip the A19 with a new ultra-low noise moving magnet (MM) phono stage that allows the music enthusiast to enjoy their vinyl collection afresh. While the use of high performance headphones has grown dramatically of late, little effort has been made to improve the headphone sections of the amplifiers that drive them. The A19 addresses this by employing a completely new circuit that can deliver a level of sound quality that will thrill even the most demanding listener. The A19 is built to the same very high standards as the company's other FMJ series products. Arcam engineers have chosen every critical component using careful measurement and years of design experience. These audiophile grade components are designed into a circuit layout configuration that has been carefully optimised for the very best performance. The A19's audio circuits are combined with an ultra-low noise power supply built around a muscular toroidal transformer. These state-of-the-art electronics are encased in a resonance damped chassis which exudes quality and perfectly matches the psound quality of this outstanding Arcam amplifier. The A19 is designed in the UK and available in a discrete black finish. E&OE - All specification values are typical unless otherwise stated. What Hi-Fi? 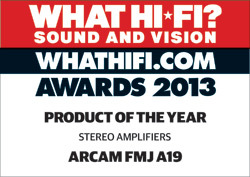 Magazine Declares the A19 a 5 Star "Wonderfully Talented Amplifier"